Mike Moroney has always had a good opinion of Wham and the son of Fiorente delivered impressively at Echuca on Monday. Settled off a solid early speed by Jordan Childs, Wham was spotting the leaders several lengths into the home straight but once eased out wide let down powerfully to run to the lead inside the final 100m and ease away to win the Open Maiden Plate over 1400m. It is the third start for Wham and his first attempt at 1400m. “Today’s race just worked out perfect,” Moroney said. “We’d given him the two runs and he’d learned from them. “Today he relaxed a lot better and with a nice speed in front of him he got a nice two into it and had something to chase. 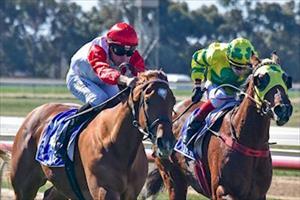 “He had a fair bit to do to pick off the leader but he was particularly strong the last 100m. “He wanted to win and he looked like a good horse." Moroney will assess the chestnut over the coming days before planning the next run. “He looks strong enough to push on into the spring and he’s mentally better so he should continue to get better,” Moroney said. Wham sold for $45,000 as a yearling to Paul Moroney at the 2017 Inglis Premier Sale. Congratulations to Kariba Racing, Mr K J Holzapfel, G G Ltd, J'raver, Mr I L Laughton, Mrs B E Laughton, Mr M J Sexton, Mrs B C Sexton, Gleneagles Stud Pty Ltd, T Fisher, G J Childs, Mrs D M Childs, Mr B Moores, Ms A M Bergin, Mr M J Clohesy, Yes Mon 3 Racing, Aliwas and Ballymore Stables (Aust) Pty Ltd.